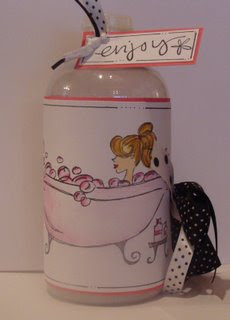 Images: 'Squeaky Baker' Whipper Snapper Stamp & sentiment is Studio G mini clear stamp set. Prismas used , what else?!! Made this for no reason other than I wanted to use some of my Whipper Snapper stamps that I got couple of weeks ago (never seem to find time to use non tilda/nellie stamps LOL). As I was laying it all out I realised it fitted the DCM mid week challenge of 'Mums's Recipe' -using 2 buttons, ribbon and spoonful of flowers. O.K I know mine's also got a big fat mouse in it too but hey, don't we all adapt recipes a little bit?! Images: 'Krilla' image sent to me . They are Rakle stamps and you can get them here Coloured with prismas. circle sentiment from an Autumn Leaves stamp set. What do you think of the girl image? I reacted to these in the same way as I did to the Magnolias. When I first saw them, I wasn't quite sure if I liked them or not but the more I looked at them the more they grew on me. I've seen a few about and the more I see them the more I love them. I just love the fact she's got such a 'real fuller' figure LOL, lots of surface area to colour in!!! Then the other one in the range is tall and lanky :D Needless to say I have since ordered some of my own (before I went on my stash diet) as I wanted a broader spectrum of 'people' in my stamps - didn't just want all bellas, tildas and nellies! Hope you get better soon Donna! There are some absolutely fantastic creations by the design team, you really must go look here. I just made a card and also managed to combine it with PTW challenge this week which is to use the colours Blue & Green together. Others: Images printed off PC. 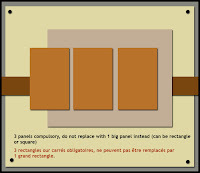 that & images cut out with petite scallop nestabilities and 2 brads to finish. Think I've just about recovered from last night's tremor. Seeing some of the structural damage to some houses on the news I think we had a very lucky escape with just shaking. It was VERY surreal though, seeing and feeling the whole room, inlcuding walls, move and not knowing what to do (not that we could do anything)! 1am, The earth just moved. . .
. . . literally! Earthquake in the UK, did you feel it?! Only 4.7 but felt quite strong to me. Being a night owl I was awake so couldn't miss it. Honestly though, it was pretty strong considering the centre was over 180km away in Hull. I wasn't quite sure what was happening so googled it to find out what was happening. Here's the map of where people have already reported tremors and it's now about an hour after the event. The last time I remember this happening I was around 11 years old and that was way weaker. Ooo that was very surreal, not used to this sort of thing in the UK, don't know how people who live in proper earthquake areas cope! Hope there wasn't too much damage where you are, will check the news and find out in the morning. Night night! 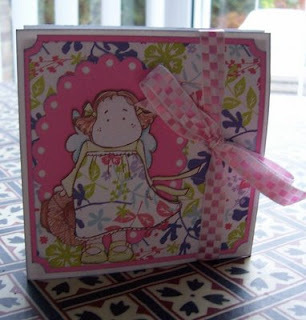 Images: 'Lola with flowers' Sugar Nellie stamp as usual prismas/sansodor used. 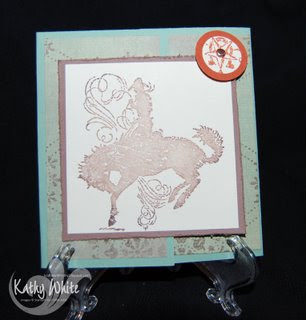 Tag is studio g clear stamp embossed and coloured with an ink pad. This week's challenge was to use lilac & lemon, not a natural colour choice for me but I think it works for a fresh spring card. Sorry for the lapse in cards but mojo went for a bit, thank goodness for blog challenges. I find it really helps to get me motivated sometimes. 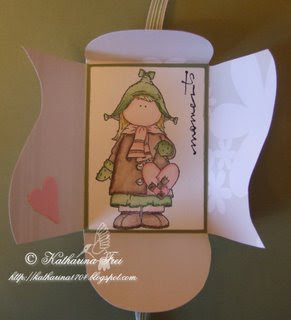 This card is also based on our SBS8 sketch challenge. I just flipped the sketch. Right, also MUST stop with the stash buying now lol. Jo, you just made me get the scor pal which I've been looking for and Marlene, I've gone and ordered 'some' Rakle stamps thanks to you! Poor postman's gonna be worn down for the next week but that's it now, stash diet. Should have enough coming to keep me busy (well until the new lot of tildas come out anyway) so if you see/hear otherwise, you have permission to stop me! Off to play some more, to justify all this crazy spending. Quickly made this yesterday to go with some images I've sent out. Yep it's other ATC. These are incredibly addictive. Just need to try some more collagey ones in the future but not when I'm in my 'colouring in/cute phase' :D Used my prized Sarah Kay stamp. Hunted high and low for them and only managed to get this one - all the others are sold out and company no longer making them :( This image was actually badly stamped as stamp was new so hadn't quite got to grips with how hard to press and where, so part of the legs on the highchair hadn't come out. So rather than thowing it away I thought I'd try and turn it into an ATC by chopping off the bad bits!! Hence it's a funny angle but I quite like it like that! Then all I did was colour it in, add a tiny sentiment at the top and faux stitching round the sides plus a little fabric flower and Voila! Not made anything today, been busy blog hopping and trying to tidy/resort bits of my craft room again. Things start building up after a while and it's time for a sort out . . to make room for more goodies LOL . Pre-ordered the ever so cute 'Little Cotton Bunny' stamp kit over at Funky Kits, been waiting for these. If you haven't seen them go check them out, so hard to resist! Also Glitterpot have free P&P today to celebrate their craft award so a few things ended up in my basket! 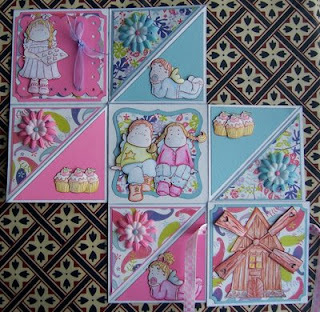 Well finally did it and made some last night as I'm taking part in a tilda ATC swap! (So look away if you're in that swap and don't want to see until after!) It was such fun, I made them in no time! I think because it wasn't a card or didn't have to be for any reason that I found it much easier and creative (only rule was it had to have a Magnolia image on it). I basically just rummaged through my scrap box, found part of an embossing panel which was left over, so cut that up and used the 3 brown words as the main theme for my 3 cards and then just found bits of paper & coloured the tildas to match (although it was tough finding tildas to fit the little cards). I made 2 of them 3D and they are stuck on with foam pads (although can't tell from photo) and I wanted to make them quite tactile so added texture with embossing and bits of metal embellishements and ribbon. What do you think? I really like them, so much so that I'm going to see if I can load it up as my banner! Off to have a play now. O.K, after getting my goodies off Leann the other day I've sorted a few bits out so now it's my turn to Pass-It-Forward. You all know how this works don't you?! First 3 to leave me a comment on this post will get a little something from me via your lovely Postie :) Then you do the same for 3 others. On your marks, get set, GO . . .
Ismaki sketch this week is this, with the added option of metal: I think it's a great sketch but really struggled with it. I think it's because I like just using one main image or I'm just losing 'it' at the moment. Like I mentioned earlier, wasn't that happy with my first attempt, so then made this and still not 100% happy, but prefer it to my first one. The colours aren't as strong IRL, but I think I should have put the strip of pink behind the paper then there wouldn't be so much showing and the colours would sit better. Also didn't like my colouring on this as I rushed it and didn't use my Prismas (! ), but water brush and some ink pads. Oh well, I did like the embossing and the eyelet bit! PTW Challenge: Spring in your step! Challenge this week over at PTW is to make a card with a spring theme and there's a prize up for grabs. 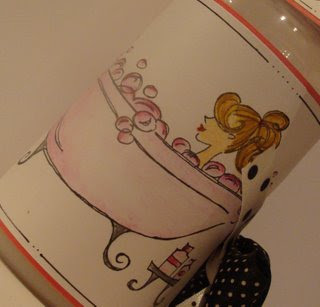 Good opportunity for me to use one of my super cute Whipper Snapper stamps I got last week. This one just called out to me and I had to have him as he just makes me smile, hopes it has the same effect on you! Did actually make 2 other cards. One was for the Ismaki Challenge but not happy with it, so will try again and the other I forgot to take a photo off before I sealed it up, D'oh! 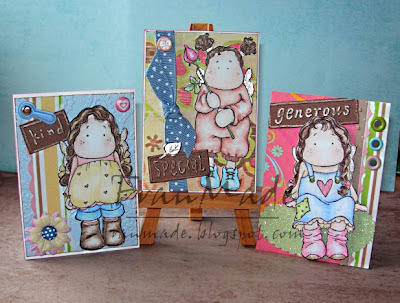 I used Katharina's fab sketch which she's got up for her blog candy challenge. I'm not entering as I've already got the tilda stamp on offer but you should go look, as her creations are always beautiful and very inspiring. 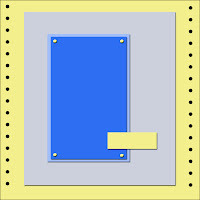 Oh, my card also meets criteria for Daring cardmaker's theme this week 'Love & Friendship'. Then I got this PIF candy from Leann. I've been lusting after some of the big flowers I've seen her use and guess what, there was some in the candy along with some gorgeous ribbons and images, so a very good post day all round. I'll have to put something together and do my PIF so check back in the next couple of days if you'd like some candy (can't guarentee it'll be as good though!). look what Marlene awarded me! I'm sooo touched not just for the award but for what she wrote. There are soo many great blogs out there but of the ones I've come to know so far, and as well as Marlene, I would like to pass this award onto 2 people, who's style I love, Jo & Gwen. Jo, even though she's already got 1, as I've come to see her as another blog buddy and I love the clean simple lines to her cards ('simple' in a good way Jo!). I always look forward to seeing what she's been up to! Gwen, my SBS 'sister' who's blog I always look forward to reading as she always has such clever little projects and cards, which she just seems to throw together so easily. I also love the simple sophistication and elegance of all her cards, hopefully if I keep looking, it'll rub off! Not a stamp in sight! That's right, I used my BIA to make another notebook for my hubby but not a single stamp was used as he's typical man, only wants 'manly'/minimalist. So as all my new cuttlebug embossing folders arrived today I decided to use those instead. I'm so glad I got all the ones I liked all at once, as I think they are fantastic and the designs are even better than their first lot, which I love. Anyway, here's his notebook in his favourite Charcoal/metallic colour if you can call that a colour! Covers made using 1 sheet of pearlised charcoal card from stash and 1 sheet of DCWV metallic card in 'gunmetal' . All backed with another sheet of card from stash. Used embossing folders (numbers collage, distressed stripes, diamonds in the rough) then just added ribbon, brads and metal embellishments from stash. 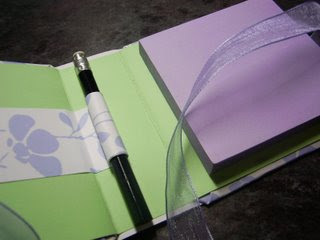 Notebook: Made with BIA. Pages printed off pc and cut up (A4 cut into 3, landscape). Cover made from 1 sheet of 8x8 DCWVcardstock(Glitter stack). I was in the middle of trying out my valentine pressie from hubby, and was making a notebook with my Bind It All, so have managed to complete this challenge really early for a change! I found some string (well cord, but same difference really) off a clothes tag I'd saved (more recycling!) and it was a perfect match so I just used it to attach a couple of heart charms to the notebook. The BIA seems really easy to use but I only did a slim book so haven't tried punching more than 1 set of holes yet, wanted to keep it simple for my first try. I can see I'm going to want to make books out of everything now, as it's soooo simple to put together LOL . Well Hubby wants one after seeing mine so got excuse to make another but he wants it in black, typical man! Talking of colours, I don't have 1 favourite colour, but I do tend to go for muted, earthy shades alot, along with pinks and reds so I think this is a good example of the colours I like, for entering into Claudia's Blog Candy. 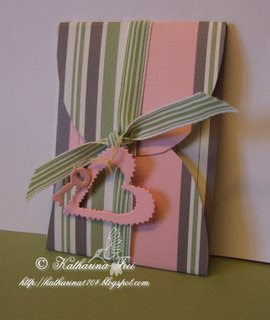 Hmmm, Criss Cross card, not sure. Thought I'd try a criss cross card, as it's been one I've been meaning to try for a while now. Not sure of the outcome, this sort of card is out of my comfort zone. Think I need better co-ordinating bits, all my stuff is from all over the place so have to match colours up as best I can and I don't have enough range of colours in my flowers/ribbons (need to rectify that :D). Was going to use this for entry into Claudia's blog candy but not that happy with the colours. As the challenge is to use your favourite colour it's back to the drawing board. May go back to cute! Finally got round to making this, using one of my new High Hopes stamps. The sentiment was a freebie with my order, which fits it perfectly. Isn't she a cutie? Image: 'Trish tea angel' and sentiment, High hopes stamps. coloured with prismas/sansodor. Used sakura stardust pen to highlight the steam and clear glaze pen on the teapot but can't tell on photo. I will try and complete this challenge earlier next week but just had too many goodies to play with this week. Oh, I've tried something new with my colouring that I've seen elsewhere and that's colouring in a grey shaded border round my image. I've yet to perfect, as it's my first go, but I quite like it, makes the image 'pop' IYKWIM. Hope you all had a happy valentines day and got the lurve and pampering you deserved :) I've been very good and haven't played with my Bind It All (my valentine's pressie which I got few days ago) as I wanted to finish some of the challenges first and get some things out the way. Paper: Masculine paper pack, dovecraft. I flipped the sketch and made a kick stand card rather than a tent fold. 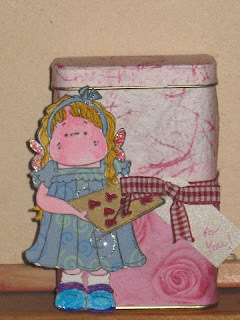 Thought I'd give my Tilda's and Nellies a break and use 1 of my bella stamps. This will be for my bro-in-law's birthday in March and who has taken to his BBQs since moving to the states (Florida). 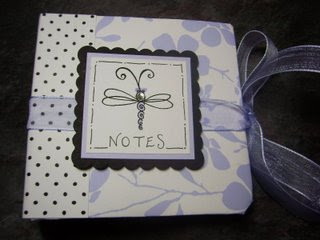 Others: used cuttlebug embossing folder on the scallop fram and also for the sentiment plus square nesties. ribbon from stash. O.K, this is the card that I mentioned the other day but couldn't show but I can now as it's arrived at it's destination along with the candy. I am really loving using brown with another colour at the moment and liked the way this turned out. I can never be sure when I start what it will end up like but I liked this one and luckily, Debbie did too :D!
" I have had lots of ideas but the one I like the most is Recycling! Because I am a huge recycling freak I thought it would be good to have a challenge where you have to use an item that has had a former life.It could be a piece of card or paper from some packaging, cereal box card made into chipboard letters or shapes, ribbon taken from an article of clothing or chocolate box, old buttons taken from a garment etc.So This week we would love to see your Mothers Day Art Work involving Recycling along with of course Magnolia stamps." Well, the only thing I could find that was suitable, was some ribbon which came with some PJ's I got over Christmas (and which some of you will recognise as I'm sure that's another gift favourite at Christms along with socks and smellies!). 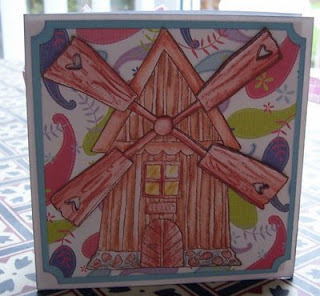 This week's challenge was just to use the colour orange with any sugar nellie stamp. O.K, I'd said I'd show you the difference between the regular scallop and the petite scallop sets of ovals. I've taken photo of the 3 sets that I now have. The middle set is the 'regular scallop' set in the Large size. The set on the right is 'Petite scallops' in the Large size. So you can see that it's not just the scallop size that is different. 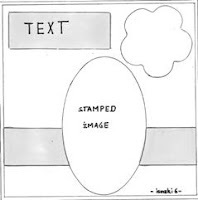 The actual shape of the ovals are more squished but the other thing I love is that the actual ovals are also a lot larger so you can fit a much bigger image in them too. You can see that both 'petite scallops' sets (left & right) are bigger than the middle set! I think the petite ovals are perfect for sentiments, where I found the normal ovals too round.
. . . just found out I won one of Kraftin Kimmie's challenges (thanks Jo, for being bearer of good news :D ). That's all really, just needed to share that with you! Will be back later, to post some cards. Woohoo, no cards to show (well, not by me anyway), maybe later, as I've had a mega stash day or should that be days! This came through the post today . . It's the petite scallop oval set nestabilities and got some high hopes stamps! I love my nestabilities and when I saw the petite scallop ovals I had to get them as the oval is more flattened than the regular scallop set and I really like that. They are also a lot bigger than the regular set which is a bonus (I'll have to post a picture of the difference to show you). I got it off ebay and the seller happened to have the 12 set of prismacolors which are the 'new shades' so I got those as well seeing as I was paying for postage anyway (do you like my thinking?!) I ordered these 3 weeks ago but the wait was worth it. The high hopes stamps are so cute and I've seen a few of them around but uk wooden mounted ones are a bit pricy. However, they have an online store (Canadian) and you can buy unmounted which is what I did. This way, postage was peanuts and they need less space! She threw in quite a few extra stamps for free as well, and I only ordered 8 days ago, so am a very happy bunny. Just need to stick em to my EZ and I'm off! I'll definately be using that site again, highly recommended! Then I also got this lovely card from Vanessa, who doesn't have a blog but is fellow tilda lover so I sent her some images and she went and sent some images and die cuts back with this lovely card. Thank you Vanessa, you didn't have to! Images: 'sp08 love tilda' & 'sp08 charmer edwin' slightly modified as I cut off their wings and gave tilda a haircut to make them look like me & DH! coloured as usual with prismas/sansodor - can you tell I love'em?! 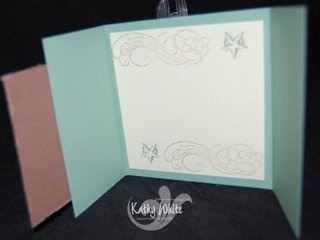 Background: is just a gorgeous piece of 8x8 DCWV cardstock from their 'all dressed up' stack. I couldn't bare to cut into it so this is perfect! Needed to make a non red/rink valentine for our first SBS8 challenge. I've already made a card for hubby which nearly fitted the bill as it was mainly black and white but unfortunately there's also a tiny bit of pink so couldn't use that. So instead I've made a scrapbook cover. It's going to be an 8x8 scrapbook I'm making for DH and will chronicle the 2 of us over the years, starting with when we first met back at Uni in 1991, so it could take a while and will be one of those on-going projects LOL. Been busy playing with my new tildas and made 2 more cards. One I can't show yet as I'm going to send it to Debby to go with her candy prize (hope you like it debby, it'll be winging it's way over to you in the morning) but the other one I decided to make up and enter in another one of Kraftin Kimmie's birthday challenges. This was a colour challenge and it was to use spring colours, so I hope this fits the bill. As usual it took me a while to come up with a layout but it ended up being a tent fold card and the main images are raised on foam pads. Others: 'spring is in the air' studio G's mini clear stamp sets. 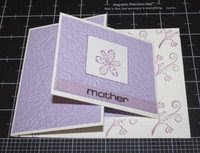 stamped onto card and used my corner rounder plus a brad from my stash. Need to go and put my thinking cap on for this week's tilda & co challenge as it's recycling mothers (or the long version is to make something for mother's day which includes recycled stuff but I thought the short version was better)! The only slight downer was that 2 of my stamps had a slight nick in them (where whoever cut them out wasn't paying attention!) 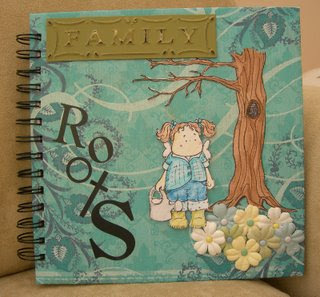 but not something I couldn't touch up once stamped and coloured, just annoying as the quality isn't what it should be. Anywhere else and I'd expect a replacement but those that have dealt with them will be laughing at that notion. Managed to stamp lots out ready to colour but only made this one card, which fits the bill for one of Kraftin Kimmie's challenges on her blog. She's got a whole week's of challenges with blog candy for each, check it out. This one is for a valentine/lovey type card. I love the slouchy socks on this Tilda! of my blog candy is, . . . . .
Hubby was bowled over with the colours and all the detail. So congratulations Debby, please send me your snail mail (my email address is on the top right of this blog under 'contact me here') and I'll send your goodies to you. Thanks again to everyone who played, hubby had a hard time deciding! I'll have to do more of these as it's been fun! 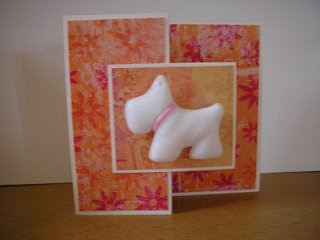 Sliding pop up card, "Sew Nice"
Look what I got . .
UKS Sugar Nellie Challenge #2 "Just paw U"